Here are four questions to ask yourself to help make the best resolutions. Let's put aside those insane resolutions to "join a gym" and "cut down on chocolate and alcohol" a moment. Welcoming the new year is a great time to evaluate yourself and make healthy, beneficial and realistic goals for yourself and your business. But where do you even begin? Here are four questions to ask yourself to help make the best resolutions. 1. What were your most fulfilling moments of 2015? Think about a time when you went to bed and your mind was calm and happy. For me, going to bed is usually the time when all of my doubts and concerns actually surface. So, when I lay my head down and my mind is at peace, it's usually because something fulfilling happened that day. I don't mean fulfilling as in, "We made a huge sale," or, "Our numbers are really high." I mean fulfilling more in the context of a moment where you know your business means something. Our business, for example, is dedicated to donating headbands to kids with cancer. So, when I get a call or message from a parent whose child received and loved one of our headbands, that's my fulfilling moment. It's important to make resolutions that encourage you to find fulfillment, not just money. 2. Who are five people who supported you this year? Remember that time you were really in a bind, and that special someone who came through for you? Think about the five people who really helped you out this year, in a work-related or personal scenario; and make it a resolution to build your friendships with them. 3. When the momentum was really moving in your business, what was the cause? What worked well in your business this year? If you can think about times when your product was really moving, what was the cause? Maybe it was a product style, a marketing campaign, a representative program or an advertising investment. Whatever it was, make a resolution to do more of it. Sometimes, instead of racking your brain to think of new ideas, remember what worked well in the past. 4. When were your employees happiest? Have your staffers write down their happiest work moment of the year, anonymous or not. Make it your resolution to do more of whatever they they write down. Maybe they've noted a company bowling outing, or a successful project a staff member was proud of. 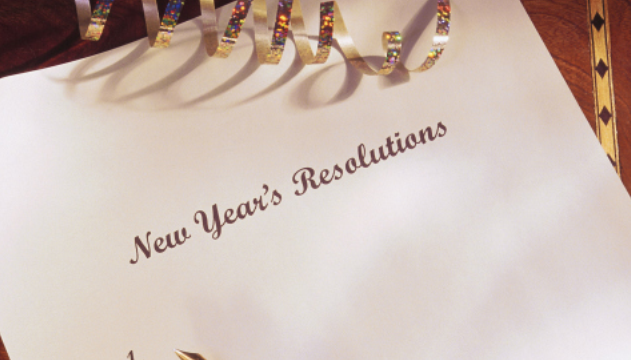 When we think of resolutions, we usually associate them with bettering our own lives. But if we keep our staff and the important people in our lives happy, that achievement can end up meaning a lot more than a gym membership.